Our research focuses on exploring the mechanisms underlying the pathogenesis of multiple sclerosis (MS), neuromyelitis optica (NMO), and other antibody-mediated autoimmune diseases. As a long-standing member of the BMBF-supported Clinical Competence Network Multiple Sclerosis (KKNMS), we cooperate closely with other national MS centers and take part in multicenter research projects. The Molecular Neuroimmunology Group is associated with the neuroimmunological outpatient clinic, where patients with MS, NMO, myasthenia gravis, autoimmune ataxias, and immune neuropathies are seen on a regular basis and where national and international multicenter clinical trials for MS and other neuroimmunological diseases are coordinated. In addition, our group is in charge of the cerebrospinal fluid (CSF) laboratory at the University Hospital Heidelberg and we work on broadening and optimizing the spectrum of diagnostic methods in the field of CSF analysis. Immune regulation in multiple sclerosis: For many years the group has been interested in aspects of immune regulation in MS involving regulatory T cells (Treg). We have been able to show that Treg isolated from patients with MS harbor reduced numbers of naive cells within circulating effector and Treg subsets, thereby prompting diminished functional Treg activity (Hug J Immunol 2003, Haas Eur J Neurol 2005, Haas J Immunol 2007). A role of premature immunosenescence is strengthened by results showing that (1) CD4+ T cells from MS patients express markedly lower levels of IL-7Rα on their cell surface than those from healthy persons of the same age, thereby affecting frequencies of naive and RTE-Treg and, consequently, Treg function (Haas Eur J Immunol 2011); (2) frequencies of circulating dual-receptor Treg designating cells released from the thymus are reduced in MS (Haas Eur J Immunol 2011); and (3) homeostatic abnormalities are also detectable in pediatric patients (Balint Neurology 2013). In line with this data, patient-derived Treg comprise disproportionately increased numbers of non-inhibitory cells when assessed with regard to their potential to suppress Ca2+ signals in adjacent conventional T cells (Tcon) at the single-cell level (Schwarz J Immunol 2013; see Figure). This distinguishing feature correlates with diminished quantities of naive Treg subtypes. Complementary studies have shown that Treg are not abundant in the inflamed CNS and are prone to pharmacological modulation in the systemic compartment (Fritzsching PLoS One 2011). Further studies focusing on the role of B lymphocytes in MS have revealed that B cells undergo unique compartmentalized redistribution in peripheral blood and cerebrospinal fluid (CSF) during active MS (Haas J Autoimmunity 2011). We recently demonstrated that unique B-cell patterns are present in the CSF of pediatric MS patients. Long-term treatment with disease-modifying agents was found to differentially affect B-cell homeostasis. B-cell diapedesis across the blood-CSF barrier is currently under investigation. Autoantibodies to aquaporin-4 and myelin-oligodendrocyte glycoprotein in neuromyelitis optica (NMO) and related disorders: NMO is an inflammatory disorder of the CNS of putative autoimmune etiology which mainly affects the optic nerves and spinal cord. In 80% of cases, NMO is associated with pathogenic antibodies (termed NMO-IgG) which target aquaporin-4 (AQP4), the most abundant water channel in the CNS. In a subset of patients seronegative for AQP4-IgG, antibodies to myelin oligodendrocyte glycoprotein (MOG) have been shown to be involved in the pathogenesis. We have recently systematically analyzed in a multi-center study one of the largest cohorts of patients with MOG-IgG encephalomyelitis (Jarius J Neuroinflammation 2016, 2016, 2016). Previous and ongoing efforts of our group have focused on the development, evaluation and optimization of immunoassays for detecting serum AQP4-IgG and MOG-IgG as well as on elucidating the clinical and pathogenic impact of these autoantibodies in NMO and related disorders (Jarius and Wildemann Nat Rev Neurol 2010; Jarius J Neuroinflammation 2012; Jarius and Wildemann Brain Pathol 2013; Wildemann and Jarius Lancet Neurology 2013). As 10-20% of patients with NMO remain seronegative for NMO-IgG/AQP4-Ab, we are currently searching for further disease-related autoantibodies and their respective target autoantigens. Autoantibody-associated neurological disorders other than NMO: The focus of this project is on the diagnostic and pathophysiological role of autoantibodies in disorders of the central and peripheral nervous system other than NMO, including paraneoplastic neurological syndromes, Susac syndrome (a rare microangiopathy of the retina, inner ear and brain), and autoimmune cerebellar ataxia. Our group has recently discovered two novel autoantibodies in patients with autoimmune cerebellar ataxia, limbic encephalitis and peripheral neuropathy targeting the inositol 1,4,5-trisphosphate receptor type 1 (ITPR1-IgG), a key protein in neuronal calcium homoeostasis, and the Rho GTPAse-activating protein 26 (ARHGAP26-IgG), respectively (Jarius J Neuroinflammation 2010, 2014). History of neuroscience: This project focuses on the history of neuroscience in the 18th and 19th centuries, with a special interest in neuroimmunological disorders (Jarius and Wildemann British Medical Journal 2012, Brain 2013, J Neuroinflammation 2013, J Neurol 2012, 2013, 2014, 2015, J Neurol Sci 2012, 2015, 2016, Mult Scler 2011, Eur Neurol 2017). Current work focuses on elucidating the role of the blood-CSF barrier in facilitating the entry of harmful B cells into the CNS in MS, the interaction between Treg and B cells under normal conditions as well as in patients with MS, and on the relevance of MOG-IgG and other antibodies in NMO and MS. 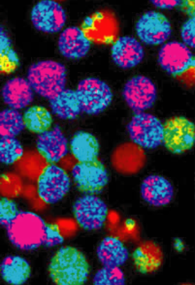 Figure 1: Single-cell Ca2+ live imaging in classified T cells. Color-coded details of an ongoing Ca2+ imaging experiment at a single measurement point. Warmer colors (yellow/red) indicate high Ca2+ influx while colder colors (blue/pink) indicate low Ca2+ influx in TCR-triggered CD4+ T cells. Figure 2: Binding of serum NMO-IgG to adult mouse cerebellum as demonstrated by immunohistochemistry (A) and to the surface of cultured human embryonic kidney cells transfected with AQP4 as demonstrated by immunocytochemistry (A, inset). Magnified images show staining of the microvasculature (B), the Virchow-Robin spaces (C), and the pia mater (D). 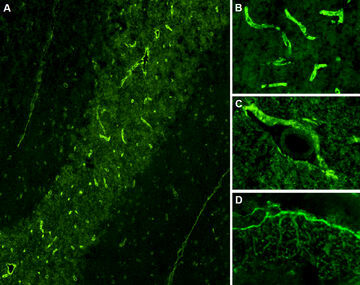 Bound IgG was visualized using a goat anti-human IgG secondary antibody labeled with fluorescein isothiocyanate. Jarius S, Wildemann B: AQP4 antibodies in neuromyelitis optica: diagnostic and pathogenetic relevance. Nat Rev Neurol. 2010;6:383-92.